Pointing a girl, Mr. Hari said,” She is the only daughter of the wife of the father of my wife’s brother. 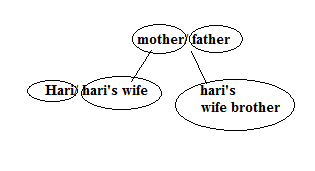 How is Hari related to the girl? A is older than B and C. D is younger than A only. B is greater than C but younger than E. Who among the following is second youngest? In a certain code, CARTOON is written as ‘3157883’ and KITTEN is written as ‘497723’ then how ROCKET is written in that code? Determine which of the following conclusions logically follow with the given statement. Statement: All chairs are sofa. 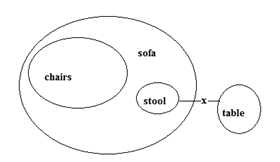 All Stools are sofa. No stool is table. All tables being chairs is a possibility. A series is given with one term missing. Find the related option. Given series is an alternate series. 2. A is older than B and C. D is younger than A only. B is greater than C but younger than E. Who among the following is second youngest? 3. In a certain code, CARTOON is written as ‘3157883’ and KITTEN is written as ‘497723’ then how ROCKET is written in that code? 4. Determine which of the following conclusions logically follow with the given statement. 5. A series is given with one term missing. Find the related option. 7. Find the odd one out. 9. Arrange the given words in the sequence in which they occur in the dictionary. 10. Find the odd number pair.